As for the Torah reading, it deals largely with the establishment of a judicial system for life in the Promised Land. It is hierarchical and includes both magistrates and priests. It is dedicated to the pursuit of justice: (16:20): “Justice, justice shall you pursue (tzedek, tzedek tirdof), that you may thrive and occupy the land that the Lord your God is giving you.” Note that you are to pursue justice, though you might not always achieve it. “Tzedek” is more nuanced than pure, rigid legalism. Justice requires judgment. More fundamentally, Shoftim concerns how legitimate authority is to be established in the Promised Land. Once the highest judge decides an issue, that’s it, like our Supreme Court (a.k.a. “SCOTUS” or “The Supremes”). A king will have authority that is clearly limited by law. The military is not all-powerful but is ordered to conduct war, including conscription, humanely. But even the law itself is only authoritative because it represents the authority of the Lord. 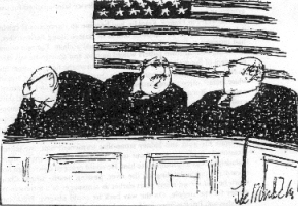 I take great and absurd pride in the fact that of all the things I’ve ever written, the one that has gotten by far the most attention was a 3 page joke “study” of Supreme Court oral argument humor called “Laugh Track” that took me about two hours to write. I published the “study” in an awesome legal journal called The Green Bag. (this is the study) Adam Liptak of the New York Times read the study and thought it was funny enough to write a goofy piece about it for the Times. The NYT story ran on December 31, 2005. Because it was maybe the slowest news day of the year, the piece ran on the front page. Liptak’s article got a lot of attention and was mentioned in all sorts of radio and television and print stories. I did lots of interviews, including one with Jake Tapper for ABC’s Nightline in which I said “uhh” a lot. 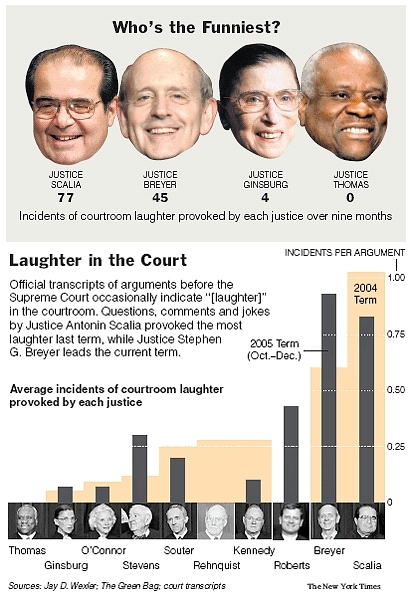 Addendum: By chance, I just came across a new article by Jay Wexler (now a Boston U. law professor), “I Made Clarence Thomas Laugh,” available at http://www.salon.com/2012/08/18/i_made_clarence_thomas_laugh/ . 6. Kings worry about a receding heir line. 8. The duke and the count had a fight. The duke was down for the count. 17. Two duchesses were arguing about their husbands. They decided to duke it out. 25. The eastern potentate spent money as if it were Emir drop in the bucket. The First Sergeant noticed a new private one day and barked at him to come into his office. “What is your name?” was the first thing the First Sergeant asked the new guy. Disclaimer: This piece begins with an apology to all of our servicemen and women and their family and friends. I do not advocate the actions of the men I describe. Rather, I am relating those things I remember as a kid. In our neighborhood, with a few exceptions, the young men were not anxious to join the Army to go to Korea. This feeling was not based in a conscientious objector philosophy. They just felt that going someplace where people would shoot at you was not a good idea. The government, on the other hand, and understandably, were kind of strict when requiring that everyone comply with the draft laws. So, our guys got draft notices requiring them to appear at a certain place at a certain time to be shipped to the nearest intake facility. They didn’t show up at the appointed time and place. The government, after a reasonable amount of time, sent either FBI or MP’s to accompany these draft dodgers to Fort Dix in New Jersey where they were inducted into the Army. That could well have been the end, but most were men of principle. The principle being that no one should shoot at them. So, individually they went AWOL and headed home. Again, the Army allowed a reasonable amount of time to pass, then sent MP’s to capture each offender, return him to camp, and place him in the Fort Dix stockade where he remained for a month or two. However, the neighborhood guys as they were released hit the road, beginning a cycle of capture-imprisonment-release-flight-capture. MP’s were in our neighborhood so frequently that they no longer got any attention. Eventually the Army smartened up. They waited until 10 or 15 were AWOL, then sent a bus with the MP’s to transport our guys back to camp and the waiting stockade. My uncle was one of these guys, and he always said that he and his friends were among the few people to leave the Service owing the government money for transportation expenses. Kind of our neighborhood’s contribution to the war effort.